THE interior decor of the dining space should reflect the style of entertaining in the home. 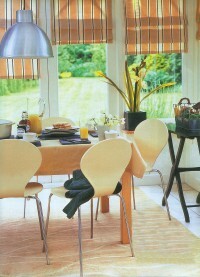 To get the maximum use from the dining space it is best to consider pale colours. Flexible lighting is essential to exploit the dining space at all times, during day or night. Dimmer switches for overhead lighting is also very practical so that people can see their food but at the same time allows the ambience of the room to be mellow. 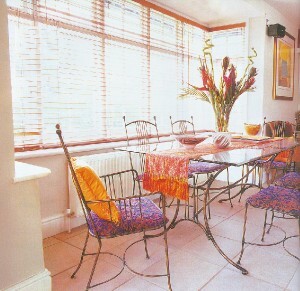 The furniture of the dining space should also reflect the style of entertaining. Round tables for example, tend to feel cosier than oblong shapes. Round tables provide no natural head, therefore making the act of dining more informal. The centre of the room is the accepted placement of tables and chairs. The centre often wins because it provides the best traffic flow for guests and serving food. Whether it is a leisurely lunch or speedy breakfast, sitting comfortably is very important. Seating affects a person's behaviour during dining. Upholstered seating provides a place for a lingering and more comfort during long meals. Less flexible straight back chairs are more suited for quick meals. Metal chairs are cold and hard and are rarely pleasant to sit on for a long length of time. The final touch to a dining space is a sideboard table. This provides storage and additional surface during meal preparation and serving.